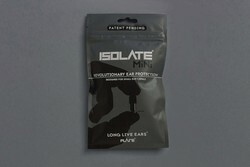 Flare Audio - ISOLATE® MiNi Ear Plugs. Bleep. Aluminium Black finish with three pairs of EARFOAMS® tips Small, Medium, Large. Aluminium Clear finish with three pairs of EARFOAMS® tips Small, Medium, Large. The Isolate Mini is the perfect way to minimise the ambient buzz that so often appears the second the final note fades. Perfectly built to fit inside the ear canal while minimising visibility, the Isolate Mini is small but packs a powerful punch. Using bone conduction to emit a live a transmission of the beat you can't defeat. All the while limiting potential hearing damage and loss without any batteries or annoying re-charging.